The Polisario is fingered with insistence after the Algerian army discovered a large cache of weapons at Illizi near the border with Libya. The location is at about 200 km from the Tiguentourine gas complex in In Amenas which was targeted in January by a terrorist attack that killed 37 persons among the employees of the complex. 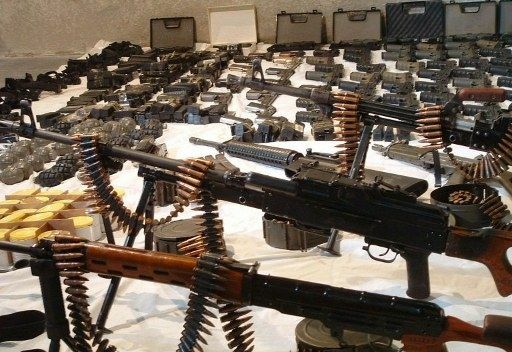 According to several sources, Algerian soldiers have seized in the weapons cache more than 100 anti -aircraft missiles, hundreds of anti-helicopter rockets, landmines and rocket-propelled grenades. The Algerian army command did not say a word about the discovery of the weapons that reportedly come from old stocks of the deposed regime of Gaddafi. In contrast, Western military experts based in northern Mali have quickly established a connection between the discovery of this arsenal and Polisario fighters, who had, upon returning from Libya, where they supported the Libyan regime, smuggled in Algeria sizeable war booty. But they had to hide away the smuggled-in weapons because of the numerous checkpoints set up by Algerian patrols along the eastern borders. After the weapons seizure was made public, the defense minister of the Sahrawi Republic, Mohamed Ould Lemine Bouhali, has ordered the polisario armed militia to barricade the Tindouf camps to prevent the escape of any suspects to Mali or Mauritania. In addition, the Algerian army and other armed bodies were placed on high alert along Algeria’s borders with Tunisia, Libya, Niger, Mali and Mauritania. Fearing that the weapons fall in the hands of the Algerian guerrillas and jihadists, the army deployed some 20,000 troops to comb all these areas. Pending the results of the investigation into the Illizi weapons cache, the Polisario chief Mohamed Abdelaziz has summoned all his lieutenants to agree on the explanations to be given to the Algerian army and rulers in case the Sahrawi refugees’ involvement was documented.